Effects transitions, to be used with all the effects. Easing Equations by Robert Penner, http://www.robertpenner.com/easing/, modified & optimized to be used with mootools. Fx. Transitions.js Effects transitions, to be used with all the effects. Fx. Transitions A collection of tweening transitions for use with the Fx.Base classes. 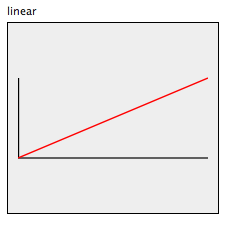 linear displays a linear transition. Quad displays a quadratic transition. Cubic displays a cubicular transition. Quart displays a quartetic transition. Quint displays a quintic transition. Pow Used to generate Quad, Cubic, Quart and Quint. Expo displays a exponential transition. Circ displays a circular transition. Sine displays a sineousidal transition. Back makes the transition go back, then all forth. Bounce makes the transition bouncy. //Elastic.easeOut with user-defined value for elasticity.